ICanToo - 100% Cotton Tiered Capri in Light Tee Cotton. MADE IN USA. 100% Combed Cotton Tiered Capri. Meet the summer days with this Light Weight Tiered Capri. 100% Combed Cotton is soft, light weight, and perfectly comfortable. A classic style with a bit of textured interest around the legs. Most want to order UP due to the Modest Women's sizes in S, M, L, XL, so be sure to See details in Size Chart. Average Waist Size 34-36" 36-38" 38-40" 44-46"
A: Relaxed Waist Circumference, measured w/o pulling waist band tight. 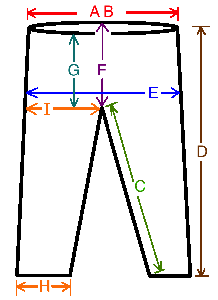 24" 26" 28" 31"
B: Pulled Waist Circumference, measured pulling waist band as far as possible 39" 40" 44" 49"
C: Inseam: Crotch to bottom of hem 20" 20.5" 21" 21.5"
D: Outer Seam: Waist to bottom of hem 30.5" 30.5" 31" 31.5"
E: Hip Circumference: measured around widest hips (8" down from waist band) 41" 42" 44" 48"
F: Back Rise: back waist band down to crotch seam 15" 15" 15.5" 16"
G: Front Rise: front waist band to crotch 10.5" 11" 11.5" 12"
H: Bottom Hem Circumference 18" 18" 19" 19"
I: Widest Leg Hip: Widest part of hip fabric from crotch to side seam 12.5" 12.5" 13" 14.5"